Last week I presented an article explaining how to solve an issue with deployed (compiled) Matlab applications. 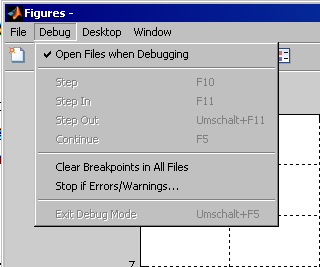 Today I’d like to welcome guest blogger Alexander Mering, who will explain how to disable standard Matlab menu items in deployed docked Matlab figures. Alexander has been an avid follower of this blog, and from his CSSM posts we can tell that he’s been heavily using advanced GUI features presented in this blog. His article today nicely shows how we can use different building-blocks presented in different articles in this blog, to achieve something new and useful. 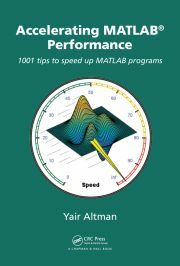 As Yair pointed out in many occasions, the power of Matlab could be greatly enhanced using the underlying Java mechanism. To me, while developing a larger standalone tool for technical calculations, these hints are worth a mint (as I guess for many of you). One of these very useful hints is the ability to dock figure windows in standalone applications. This perfectly fits to my understanding of a “clean desktop”, i.e., having as less as possible separate windows. Since in many calculations dozens of figures are generated, the desktop gets up crowded very fast – if these are not grouped. So docking is essential (at least for me). Unfortunately there seems to be a serious problem with the resulting menu entries (at least in R2011b on Win XP), leading to a crash of the standalone application. Based on the posts by Yair, I will sketch a possible route to avoid this issue. Since crashing menu entries will be found and used by end-users (though these are somehow hidden), these prohibit the usage of the docking feature as long as these could be invoked. So how can we disable / remove these menu items? Unfortunately, the straight forward solution of getting the handle to the Figures containers’ menu bar and remove the unwanted items does not work. The reason for this is the (to me unexpected behavior) that the menu bar seems to be rebuilt whenever a figure is docked/undocked. Therefore, removing unwanted menu items only helps until the next figure docking/undocking. To make it even worse: also pressing any of the buttons within the document bar (if having more than one figure) somehow rebuilds the entire menu structure, reverting our changes. So the solution becomes a bit more complex. Now, whenever the figure’s WindowStyle property (which controls the docking state) is changed, our docking callback is invoked. The next piece of the puzzle takes care of the menu rebuild whenever any document bar button is pressed. To overcome this behavior, the idea is to define the MousePressed callback of theses buttons to (again) invoke the docking callback. This is necessary for two reasons: First, pressing the button (i.e., changing the current figure) rebuilds the menu, overwriting our changed menu entries. Secondly, all other buttons are also somehow rebuilt and the callbacks are removed if a new figure is docked. 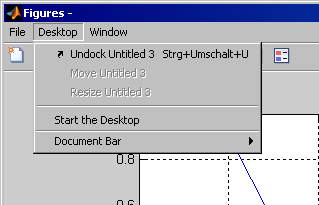 where the loop runs through the current buttons in the document bar. Since this callback is invoked whenever a figure is docked/undocked, or the currently shown figure is changed (by pressing the document bar button), all unwanted menu items within the Figures menu could be removed. I must admit that above solution is still imperfect. For instance, sometimes there is a larger delay between the docking (or button press event) and the removing of the menu item. Nevertheless, this solution allows me to distribute my standalone with docked figures without having menu items directly leading to a fatal error. As could be seen from the screen shot, the Matlab desktop becomes available also within your compiled applications. This might be wanted. If not, it could be removed the same way as the other menu items. One drawback of making the desktop available should be mentioned: In my tests, the standalone Matlab desktop shows the whole list of recent files I have in the Matlab editor at compile time. This is somehow ugly but not that problematic. Additional menu items could be added, giving more possibilities for modifications. 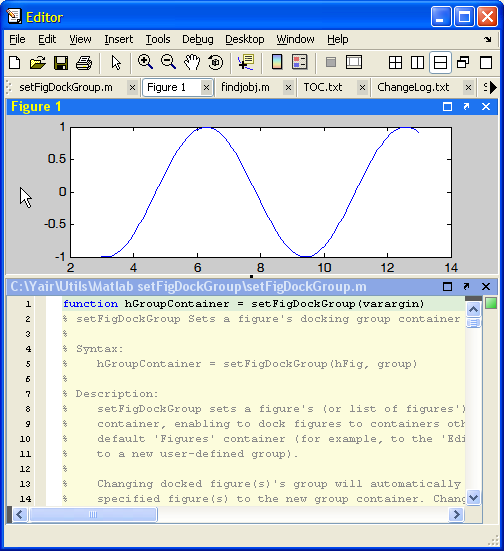 I have uploaded a first version of the docking and creation functions, together with a small test project, to the Matlab file Exchange. Readers are welcome to download the code and send me improvement suggestions. Or you could simply leave a comment below. I already made an update to the FEX. In the Callback_DockingFcn of yours, I am getting error in the line. Can you tell me whats wrong? You will see the hierarchy of the sub-containers and you can easily navigate them via .getComponent(index). Just remember that index 0 means the first child, 1 means the second etc. If you need professional help, consider employing my consulting services. Use the email link at the top of this page. It is taking a long time to execute this command, any idea? I figured it out using your suggestions. I am still fixing some issues, but I get the general Idea. There is one little issue. When docking and undocking, the menu comes back. Is it possible to add a listener to the ComponentCount Property of the Menu Bar? @Raja – try using ComponentAddedCallback or ComponentRemovedCallback. See here. You can also view the elements structure by using findjobj without outputs. I’m having a similar yet different issue. on my deployed application the user can generate plots(figures). The figures which are generated on the compiled application has only ‘File’ in the MenueBar and does not have all the options on the ToolBar. The one which is mostly required is the ‘arrow’, with which the user can choose part of the figure such as the legend window, title, axes and edit them and their properties. Obviously, when running on matlab the figure has all its tools. @Haya – the interactive plot editing functionality is not enabled in deployed application. You will need to do this programmatically in your code if you need it in the deployed app. This is precisely what i’m asking, I can I do this programmatically? I compiled my code with MATLAB and I it as an .exe process from my .Net application. Any idea how to do this programmatically? @Haya – you did not understand. The plot-editing functionality does not exist in deployed apps. You cannot simply restore the menu item because the functionality itself does not exist. You will need to program the entire functionality yourself if you wish (yes of course it is very difficult, quite possibly not worth all the effort). @Yair thank you again for your answer. I have no idea how to and from where to start this kind of code and unfortunately I must have the plot-edit functionality on my deployed app. If you have any idea how I can get started I’ll be happy to hear.